Wheat Fields Waving II (Antique Light) | Irene Abdou Photography, LLC - Travel. Lifestyle. Documentary. NGOs, Development & Public Health. The Smoky Mountains are named after the mist that appears at the end of the rainstorms (as seen from Cades Cove, next to the Smoky Mountains National Park in Tennessee). 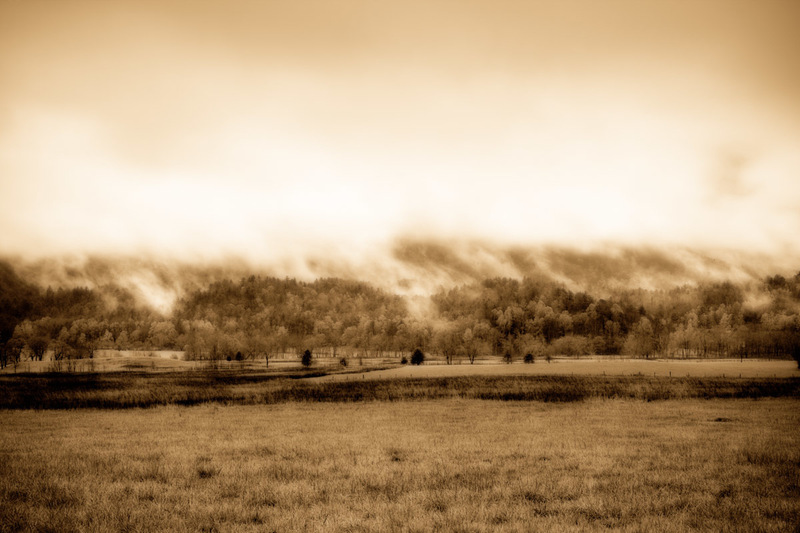 This image, sepia-tinged, is from my "Landscapes and Dreams" Collection. I pressed the shutter button on my digital SLR camera to capture these fleeting moments at various times, but it was only in the last few months of 2008 that I began to explore a new process of developing these digital photographs. The resulting images form my Landscapes & Dreams collection, made by combining two copies of each single photograph, each copy altered from the original in a certain way. The juxtaposition of these two revised copies results in the final effect.